THE PUBLISHER: Blackwell Press. Blackwell is a small firm in Lynchburg, VA. They were key to the effort because they recognized the potential for this book to make a difference and took a personal interest in the project. SUMMARY: Insights From Inside is a collection of letters from inmates written to young people talking about the bad decisions they made that changed their lives. It is not along the lines of Scared Straight. The inmates are simply reaching out and having a conversation about their mistakes. Following each letter there are some questions to help spur discussion. THE BACK STORY: The seed for this book was planted in 1967 in Little Falls, NJ. I was in a youth group that brought in two inmates to speak to us about their lives. The memory and images of that interaction are still as vivid in my head as if it happened minutes ago. In 2009 a friend shared a story about his high school buddy, BB, who was in prison for a long time on various drug charges. He was up for parole and my friend was trying to help him with that process. BB said that when he got out he wanted to help young people avoid the path he took by helping them make better decisions. That was the opening for the book idea I had in my “hip pocket”. We sent word back to BB telling him that he didn’t have to wait. He could start collecting letters from inmates now. BB started where he was incarcerated and then we networked around to three other prisons. We collected about 125 letters, many of which were from inmates who were still angry or still had a victim mentality. We eliminated those and ended up selecting 33 letters to include in the book. WHY THIS TITLE? 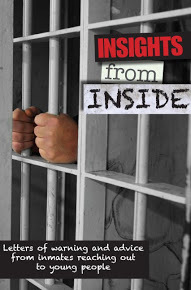 : Insights From Inside is not a book written by someone who observed what prison is like. The letters are from people who have lived it. We wanted young people to hear it from people who actually made the same mistakes many of our young people make. We wanted young people to understand the costs and the price of poor decisions. WHY WOULD SOMEONE WANT TO READ IT: The bigger question here might be why you would want a young person you care about to read it. The book is based on two primary premises. The first is that every young person is at risk of making a bad decision that could change his or her life in horrible ways. The second premise is that if a young person is already making some bad decisions, he or she probably won’t listen to someone lecturing about changing their ways. However, the one voice they may hear is that of someone who has walked their path… been there and done that. AUTHOR PROFILE: Author might not be the proper title here. Although I have contributed many pieces to Huffington Post over the years, I am not actually a writer. I am a husband, father, grandfather, community volunteer, and I spend some time in the for-profit world as a building contractor. As far as Insights From Inside is concerned, I gathered a group of people who want to make a difference. Together we compiled and published this book. LOCAL OUTLETS: In Lynchburg, VA it can be found at Givens Books. WHERE ELSE TO BUY IT: You can further check out “Insights From Inside” and purchase it on our website- www.insightsfrominside.com. PRICE: Single book orders from our site are $10.00 including shipping. For multiple book purchases from our site the price can be as low as $4.00 a copy. This is a book, and a write-up about that book, that pushes me hard to order it. Fascinating. I read a book maybe a couple of years ago written by a woman who taught Shakespeare to inmates in solitary confinement. It was both exciting and deeply distressing. It just is a life that exists parallel with our own which I could not have imagined until I spent four years in Michigan taking AA meetings into the women’s jail. Stories to tell. Thank you, Tom Gerdy, Friends, and Snowflakes. Dean, Thanks for the response about Insights From Inside. Please check out the site and share the link with your personal and professional networks. We need to reach more young people and this is a simple and inexpensive way to reach out. http://www.insightsfrominside.com. I read “Insights from Inside” prior to interviewing Mr. Gerdy on a television talk show. It’s a small book that has a powerful message & should be required reading for middle school & high school students. I believe Mr. Gerdy & those backing the project have provided the book to as many schools as possible at very low cost. If this book changes the direction even one young person takes, it has been a success. I believe it has the potential to change many directions for young people headed down the wrong path. In fact … it already has. Thank you for your response. Please share the link.